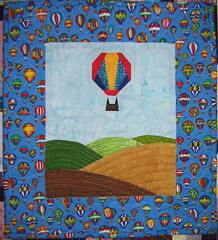 My first project was getting the quilting done on "Balloon Ride over the Palouse." The top itself was finished several months ago after I finished my granddaughter's baby quilt. I was playing around with a new (to me) technique for improvisational curved piecing. It did such a great job on those hills! I then added a paper-pieced hot air balloon and used the leftovers from the mitered baby quilt border to make a frame. I have really grown to love the Palouse area of Washington State. I've made a lot of trips to this region since we first took our daughter over to WSU for her freshman year in the fall of 2001. I love seeing the changes in the scenery at different times of the year and even from week to week. 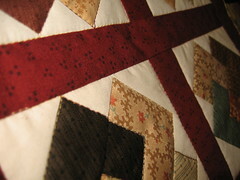 After I got the binding on the balloon quilt I did the quilting on my Mini Quilt in a Bag 2 - Simply Charming quilt. For this round my partner sent me a charm pack of fabric and I was supposed to use at least a small piece of each fabric in a quilt top. The charm pack she chose had something like 40 different fabrics in it so she told me I didn't have to use them all in the quilt but I used all but one, I think (it was a very light tan that just didn't have enough contrast with the muslin I used). They didn't all make it into the top but I used some of the larger prints for the back. I ended up just turning the back over the front for the binding. I think it turned out really great, in fact, I am hoping my partner won't mind getting her little quilt a week or so late so I can hang it in the quilt show at our church. Speaking of the quilt show, I really need to spend some time on that now as I am pretty much in charge! Your rolling hills turned out really nice. Adorable quilt!